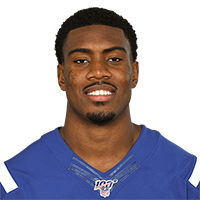 Veasy signed a reserve/future contract with the Colts on Sunday. Analysis: Veasy (6-foot-3, 221 pounds) spent time on the Jaguars' practice squad in 2018 after signing with the Titans as an undrafted free agent out of Cal. He'll compete for a depth role in the Colts' receiving corps ahead of the 2019 season. Veasy was signed to the Jaguars' practice squad Tuesday, Daniel Popper of The Athletic reports. Analysis: Veasy is an undrafted rookie out of Cal, where he racked up 38 receptions for 491 yards and six scores on 69 targets in 12 games last season. The Jaguars added the receiver to their practice squad following Allen Lazard's departure to Green Bay. There are no videos available for Jordan Veasy. Click here to view all videos.